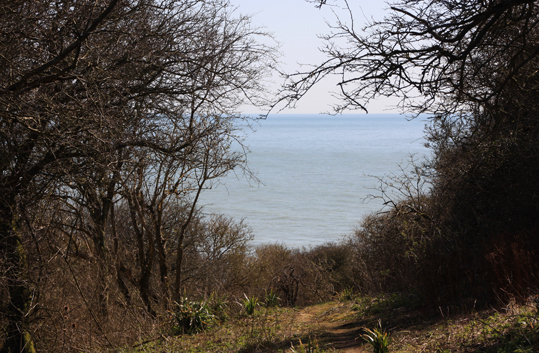 Yesterday the sun was shining, the sky was blue and my hubby and I went for a lovely walk over the Sussex Downs to a little cove that we thought was something of a secret only known about by those who live in the area and dedicated ramblers. The route to the beach is normally pretty deserted even when nearby Seven Sisters Country Park is teaming with tourists. 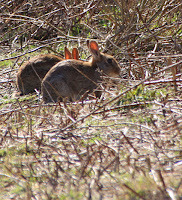 Certainly we hardly saw any other humans while we were walking - although there were plenty of rabbits to be seen hopping about happily on the grassy slopes, enjoying the bright morning. We arrived at the cove just as the tide was turning and starting to go out. Waves were still breaking over the bottom of the steps. We almost had the beach to ourselves and we found a sheltered spot against the bottom of the chalk cliff where we could sit and have a picnic while we watched waves crash over rocks. It had been a particularly high spring tide that day and the shoreline was scattered with beautiful shells that had been washed in. I picked up a few large ones to take home to use as holders for candles or to burn herbs in on my altar.